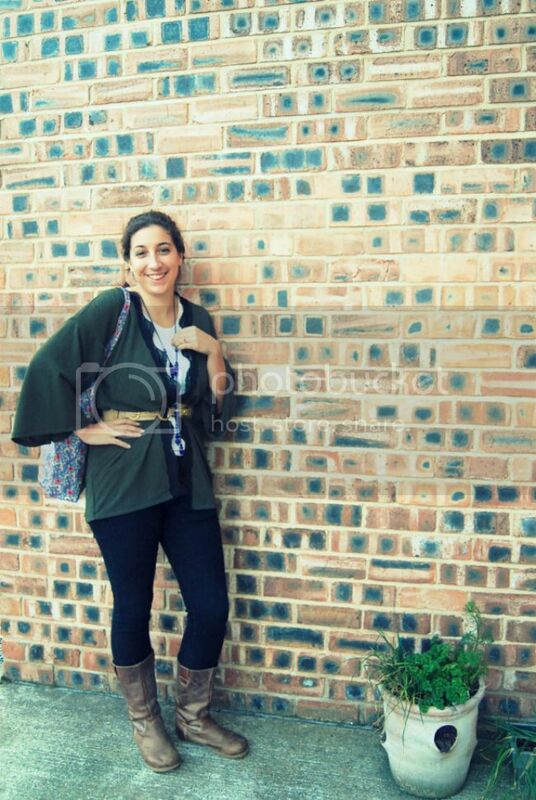 I think a kimono jacket is a wardrobe basic. Pretty, but so versatile. These babies can be worn with anything but are that little bit more interesting than a plain old cardie. As the basic structure of a kimono is actually very simple, I decided to try and make my own instead of parting with hard-earned cash! So, I’ve attempted a little tutorial of how to make your own! It probably took me about 4 hours to do in total so a fairly simple sewing job. This is my simple pattern, drawn from a kimono I had around. You could change this up by making the sleeves longer, or tapered or by making the front into a butterfly hem. The length is just below the hips on a 5ft5 woman, and fits loosly on a size 12/14, so you might want to size up or down, but remember to always leave a 2cm seam allowance! Lay out your fabric. Measure and mark your pattern pieces, with seam allowances. 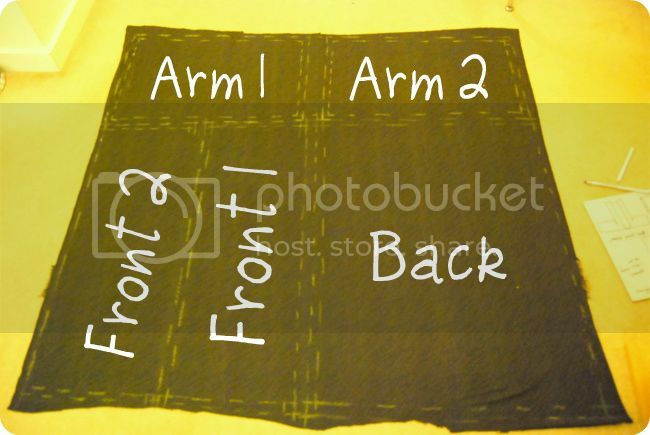 Remember to draw on the reverse of your fabric! Then cut your pieces out. Putting the topside of your fabric pieces facing towards each other, pin the hems of your pieces first and then pin the seams together. Don’t forget to leave the armholes unpinned! Then sew. If you want to be really fancy you can mitre the corners of the hems on your front pieces, which makes them so much neater. Then onto the sleeves. I didn’t have as much fabric as I would prefer for this so ideally the sleeves would have a longer drape, but this still shows the general idea! 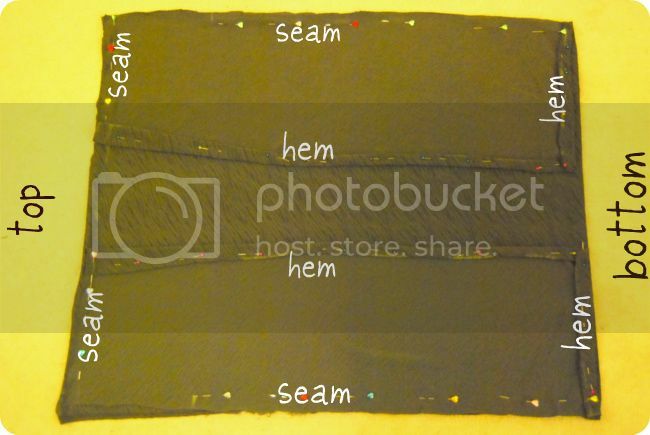 Firstly hem the edges that will be the end of your sleeve, fold in half and then pin and sew. I left 19cm on the body of the kimono and on the sleeves for the armhole. 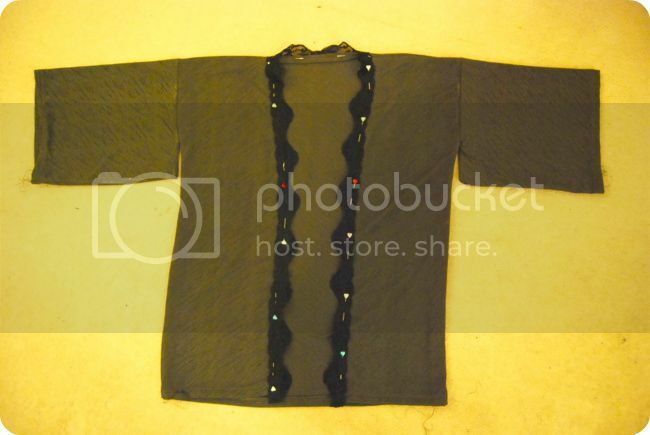 By leaving just a smallish hole and sewing the rest, you get the traditional kimono sleeve shape. Once you have your sleeves sewn and your body sewn, you just need to attach the two! 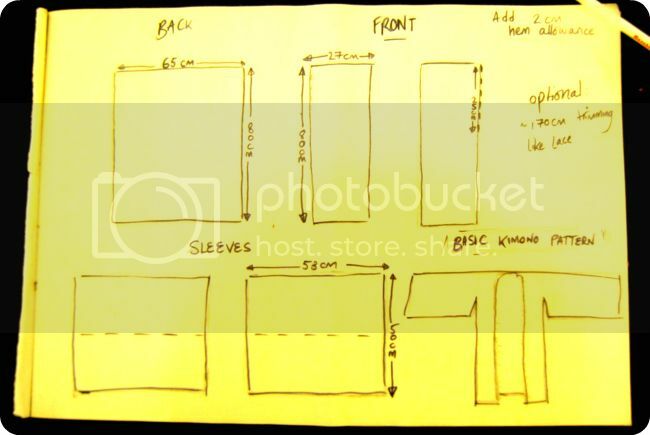 the easiest way to so this is to have the kimono body turned inside out but the sleeves the right way out, so that you can slot the sleeve into the right places and pin the sleeve so that the right sides of the fabric are facing each other. 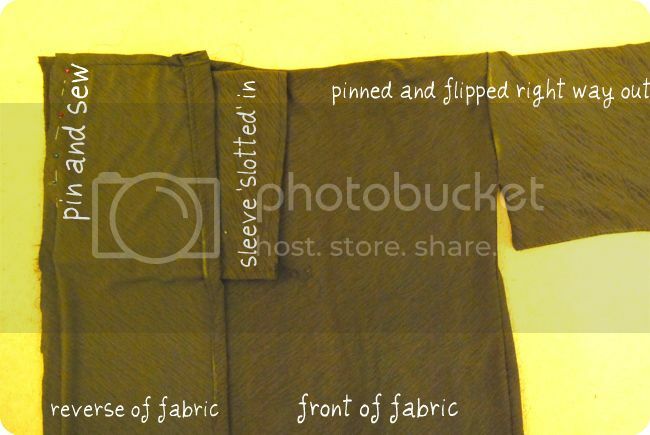 In this picture the right hand sleeve is pinned and the body turned the right way out whilst the left hand sleeve is being attached with the body the wrong way out. I hope that makes sense! 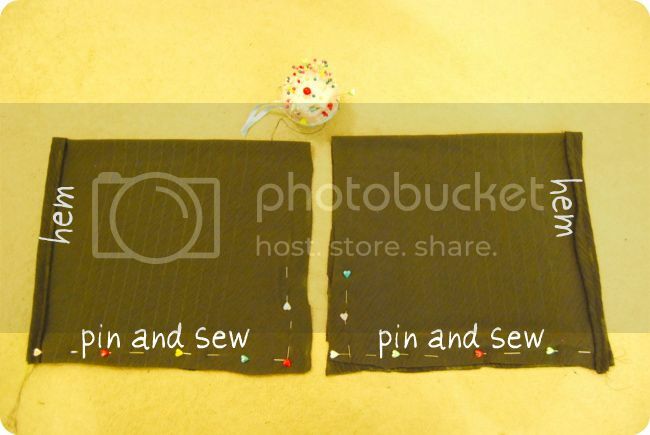 When sewing, you’ll need it to stay inside out like on the left. Remember you need to sew all the way around it in a loop, not just over the top, or you wont have an armhole! Check you can put your arm through the sleeve when you have pinned it all! Tada! You have a kimono! You can leave it as it is or add trimming. I chose to add a lace trim around the front just for prettiness. If I’d had more I would have added some to the sleeves too. 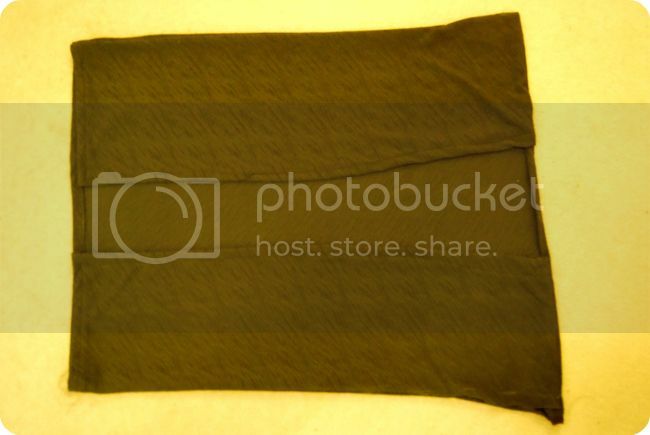 If you had spare fabric, you could even make a soft belt to tie it at the waist. The possibilities are endless! So what do you reckon? Are you going to attempt your own kimono? I hope you found this helpful, and do let me know if you try it! I’d love to see what you make. And let me know what you think of my very first tutorial! P.S. Apologies for the picture quality. The lens on my DSLR was acting up when I took these, but when I make another I may replace them so sorry until then!